It was no good they kept calling to me and so were rapidly promoted through the ranks of discarded lead to the point were I just had to paint them! These then are my first efforts with the miniatures designed to accompany 'In Her Majesty's Name' and available through 'North Star Military Figures'. So why a Chief Inspector and Sergeant from the Scotland Yard Company? 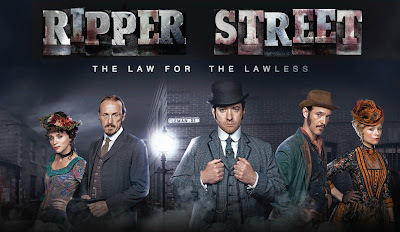 Simply put 'Ripper Street', the BBC's crime drama set in Whitechapel in London's East End in 1889, six months after the infamous Jack the Ripper murders and a breath of fresh air to the scheduling. Certainly a favourite here at 'Awdry Towers' and clearly the inspiration behind these two fine sculpts. Although pleased with the sculpts I have to report that there was a fair bit of flash and one or two prominent mould lines that needed to be dispensed with before painting could begin in earnest. As for the palette, I was predictably drawn to the characters from the series, Inspector Edmund Reid and Sergeant Bennett Drake. The costumes in the series were particularly good and there was plenty of reference available, but in the end it was greys and blues for the Inspector and more earthy hues for his trusty Sergeant. Great fun to do, but I'm afraid the rest will have to wait their turn for a little while longer, but an encouraging start nonetheless. Great paint , ad really detailed ,really nice characters . Thank you Vincent, the pin stripes proved a little tricky. Thank you Dean, I was a bit worried about that to begin with, but we got there in the end. Those two figures absolutely scream "Ripper Street!" Very nice indeed. If I was not so into wild west at the moment you would definitely side-tracked me.....you still may as there is no reason they could not work out west..... STOP TEMPTING me! I can hear the lead calling as I type. I bought two packs of "Artisan" Pinkertons at the show yesterday.... maybe 2 more would not hurt! Would round them up to 10 in number... No stop it! Stop it! Oh where dos the madness end. Nurse I think It's time for my meds! Now we all like nice round numbers! Thank you Andrew and I promise that is it for a little while at least. Wonderful Michael! I would be intrigued to hear what colours you used to paint the bearded chaps well beard the colour looks superb. Love the pinstripe on the bowler chap. Thank you Mr. Smillie, I just checked my notes at it looks like the beard was Vallejo Khaki Grey with a highlight of Vallejo Dessert Yellow, hope that helps. Very nice characters, love the faces and the poses, a great paintjob, no doubt! Thank you Phil, that is very kind of you. Thank you very much J.D. Thank you Tamsin, I really loved working on these. Nice work. It is all well done; yet, the striped trousers are real special. Thank you Jay, they certainly tested the old hand tremors! Excellent work Michael, I especially like the unshaven look! Thank you Francis, obviously tough getting a good barber in Whitechapel. Wonderful brushwork on these Michael. Thank you Pat, they were lovely to work with. Thank you, that is really kind of you. Very nice, you brought out a lot of character in them! Wonderful, Michael. Really splendid - they bring back good memories of a series I really enjoyed on TV earlier this year! Thank you Sir, it certainly was one of my televisual highlights of 2013. Thank you James, I was a bit worried about that at the time. Excellent figures and a perfect match for the Ripper Street chaps! What a great series that was!! Thank you Ray, certainly a televisual highlight for me. Beautiful figures with an excellent painting work ! and I love "White Chapel" , like so many BBC tv series ! I guess we don't give everything the over the top 'Hollywood' treatment? Thank you Sam, I think one of the reasons being the quality television is that we, the licence payer, support the corporation, putting more pressure on it to get it right. Something like that ... and I think that British People have a better culture than French People ! Their love for the Theater is important too ! See the quality of the British Actors ! Great work Michael. Very authentic. Thank you Scott, you certainly should give it a go really well put together. They look fantastic Michael. I especially like the 5 o' clock shadow in the first one. Thank you Rod, just watered down grey on top of what you would normally paint. Lovely stuff mate. I particularly like the 5 o'clock shadow. Something I've been meaning to try myself for some time. Well done! Thank you Sir, the shadow looks more impressive then it is, just thin the paint down sufficiently and slap it on. Thank you Stefan. Can you access the BBC's iplayer - it might still be on there. I love the idea of a Victorian table too - maybe one day! Great paint. I like your miniatures, sir. Too kind Rodger, thank you. Brilliant stuff. I'm sure I've paraded on with them guys!! As always Michael, wonderful brushwork - although I think you've surpassed yourself with Reid's pinstripes. Now, when are we going to see Homer Jackson and some of the girls from Long Susan's Tenter St "Establishment"? Thank you Sir, those pinstripes were a tad tricky with the aftereffects of a couple of ales, I can tell you! And I thought you only drank tea Sir! Superb work, love the strides! Thank you Dave, good to have you back! 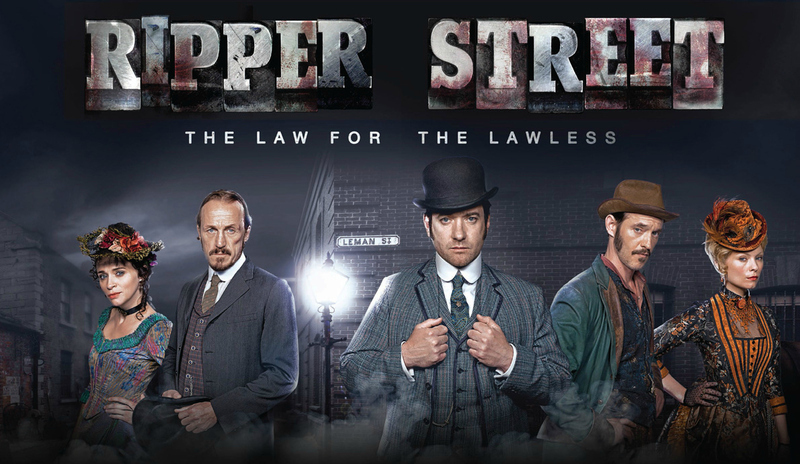 I love the figures and Ripper Street as well. Beautiful paint jobs! Very nice indeed! Thank you my good man, most kind of you. Impressive as usual - you've really captured those two. I'm trying not to get distracted on to my own similar project as that will mean looking at those new 4Ground buildings and I can't afford them at the minute!